L-R: Vinod Shivhare, Gurpratap Boparai, Justin Nolte, Andreas Jahn, Alexis Joseph, Rajendra Krishnan, Sebastian Preis at the inauguration of the expansion the Regional Distribution Centre. Volkswagen Group India today announced new steps towards improving its aftersales and service experience for its customers in India. While the Regional Distribution Centre (RDC), which was inaugurated in September last year, has been expanded, a brand new Centralised Warranty Parts Return Centre (WPRC) has been opened to strengthen part analysis and product improvement. Inauguration of the Warranty Parts Return Centre: (L-R) Alexis Joseph, Head – Aftersales, Audi India; Shriniwas Chakravarthy, Head – Technical Service, Volkswagen Group India and Rajendra Krishan, Head – Aftersales, Skoda India. 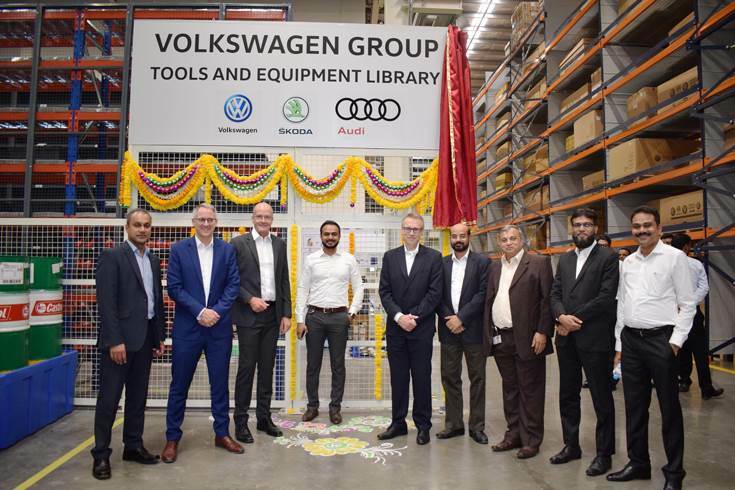 While in the first phase, the Regional Distribution Center only focused on supporting its export markets, it will now cater to Volkswagen Group India customers across all regions in the country. Spread across 25,000 square metres in the premises of Volkswagen Pune Plant, this is an important milestone for the company in India in its plan to emerge as a stronger player in the country. Present at the inauguration were Gurpratap Boparai, Head of Volkswagen Group India, Justin Nolte, Director – Aftersales & Vehicle Logistics, Volkswagen Group India and Vinod Prakash Shivhare, Head – Parts & Vehicle Logistics, Volkswagen Group India. The state-of-the-art RDC facility has been designed in co-operation with Volkswagen AG worldwide. The RDC will now distribute parts to its Parts Distribution Centres in NCR region as well as Bangalore from where further supply to all the dealerships and service stations in those regions will take place. For the dealerships in Western & Central India, RDC would directly supply spare parts to ensure that customers get one-day delivery thus improving satisfaction levels. With its strategic location, the carmaker says the RDC in Chakan, Pune will significantly contribute in reducing current lead time in providing genuine parts to the dealers across the states of Maharashtra, Gujarat, Rajasthan and Madhya Pradesh. Volkswagen India exploring CNG vehicle market "with great interest"